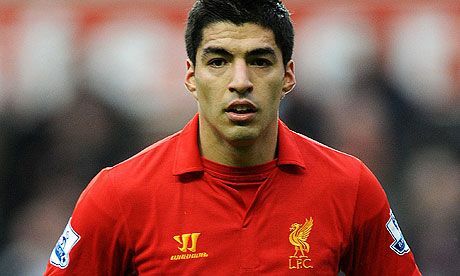 Defenders of Luis Suarez blame everybody but him for the challenges he faces: it’s the media’s fault, it’s Evra’s fault. It’s not – it’s Suarez’s fault. He talks about his treatment at the hands of the press, how he can’t even walk his baby. But Suarez has brought all of this on himself. Does Sergio Aguero, Fabricio Coloccini or Pablo Zabaleta get pursued? Have the media been camping on their lawn? No. What’s the difference? Well as Carlos Tevez and John Terry would tell you, if you do stupid things then you will be pursued, they will write stories about you and people who don’t know you will write pieces about you that may not be entirely sympathetic. It’s not a case that Suarez bites like Jermain Defoe did once, or dives like Gareth Bale does, or shows a lack of sportsmanship like Martin Keown did when roaring in Ruud van Nistelrooy’s face, or sneers and lacks humility like Craig Bellamy. It’s that he is all of these things in one insidious package. As a private human being Suarez might be personable, an upstanding individual with solid family values who donates regularly to charity. But none of these matter to the millions who see his very public petulance and occasionally outrageous behaviour on the football pitch. He says he has not been judged as a footballer? He was shortlisted for player of the year while playing in a team that stumbled inconsistently a long way from the top of the league. His goals and his skills are regularly cited and admired, even by his most fervent opponents. Suarez says he does not want to move for money or for Champions League? Well then Liverpool should only agree to sell him to a similarly-ranked club in a foreign country who will pay him the same money as he earns now: Sevilla, FC Twente, Parma, Dundalk. That will test the motivations of the player. I respect Liverpool and I respect Suarez as a player and would love to watch him week-in, week-out in the Premier League – but without the brazen and insolent swagger of the self-absorbed man-child that he is.